In the decades after the Civil War, the world experienced monumental changes in industry, trade, and governance. As Americans faced this uncertain future, public debate sprang up over the accuracy and value of predictions, asking whether it was possible to look into the future with any degree of certainty. In Looking Forward, Jamie L. Pietruska uncovers a culture of prediction in the modern era, where forecasts became commonplace as crop forecasters, “weather prophets,” business forecasters, utopian novelists, and fortune-tellers produced and sold their visions of the future. Private and government forecasters competed for authority—as well as for an audience—and a single prediction could make or break a forecaster’s reputation. Pietruska argues that this late nineteenth-century quest for future certainty had an especially ironic consequence: it led Americans to accept uncertainty as an inescapable part of both forecasting and twentieth-century economic and cultural life. Drawing together histories of science, technology, capitalism, environment, and culture, Looking Forward explores how forecasts functioned as new forms of knowledge and risk management tools that sometimes mitigated, but at other times exacerbated, the very uncertainties they were designed to conquer. Ultimately Pietruska shows how Americans came to understand the future itself as predictable, yet still uncertain. “A conceptually and historiographically ambitious book. . .The book’s ultimate contribution is not in the author’s efforts to synthesize or historiographically contextualize. It is in reinserting people in all their complexity, incomplete knowledge, and mixed motives, back into our understanding of the social, economic, and epistemological shifts that accompanied the probabilistic revolution. The nuanced, insightful, and engaging portraits of the various prophets who people its pages make clear that contingency and social construction are at work even when scientists and other experts might claim otherwise." “Pietruska deftly fits her study into a fertile intellectual space where the history of science and the history of capitalism overlap, but Looking Forward will also speak to intellectual historians precisely because of the way she is attuned to the broader epistemic implications of her subject. . . . Although the book’s subject is by nature relatively abstract, Pietruska confidently guides the reader toward a richly grounded examination of the reception of new ideas about markets, meteorology, and probability. . . This is a great benefit to the reader, and especially to the intellectual historian, who can learn much from Pietruska’s ability to pluck relatively obscure figures from the archive and use them to demonstrate how large intellectual concerns translated into the intricate problems of the workaday world." 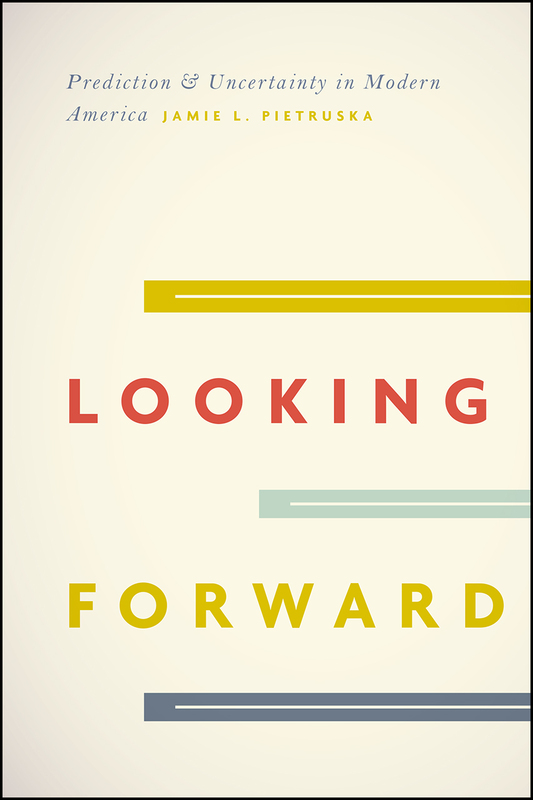 “[Looking Forward] tells an enthralling story of how people coped with the uncertainty of the future in everyday life in the United States between the Civil War and World War I." "Nobody could have predicted the past two decades, even as market gurus, climatologists, and political pundits have been ignored or made some historically bad calls. Coming at a time of widespread despair over America's future, Jamie Pietruska's smart, concise, and fun book prompts valuable reconsiderations of how our national cravings for certainty have more often been a part of the problem than a path to solutions." "Jamie L. Pietruska is among the first historians to ask how ordinary people participated in the 'probabilistic revolution,' modern science's reckoning with the unpredictable nature of the physical universe. Looking Forward paints a lively picture of the introduction of probabilistic reasoning into everyday life circa 1900. It reveals a culture of prediction that arose in the interstices where personal choices met the marketing of expert knowledge. Pietruska argues that scientists' quests to look into the future were shaped by popular demand. Concluding with a tour-de-force commentary on the predictive debacle of the 2016 presidential election, Looking Forward examines how and why Americans have come to rely on forecasts that regularly fail them."